This new Senior Friendly program was developed over the summer of 2014. It is designed to be completed by individual adults, groups or families. The activities can be completed at one of the two units of the park or both units. 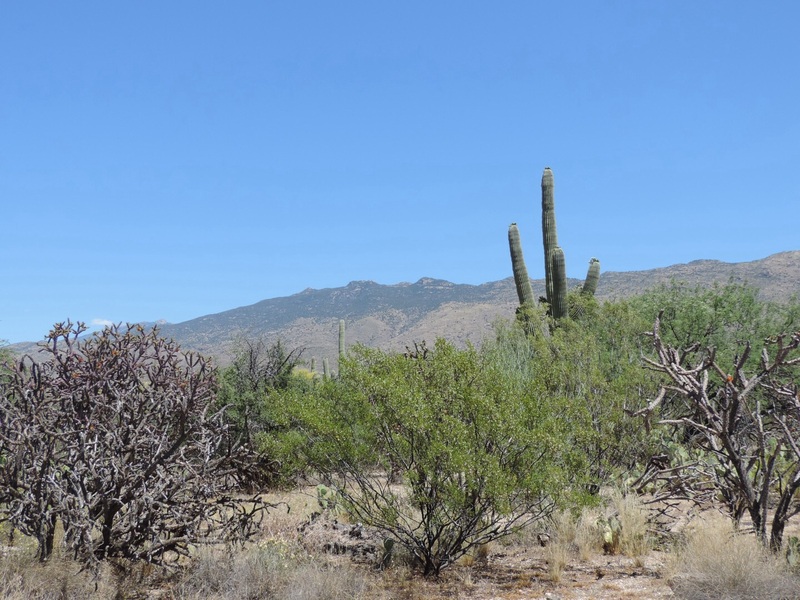 Saguaro National Park has two units, Tucson Mountain Unit on the west side and Rincon Mountain Unit on the east side of Tucson. To complete this program seven of the ten activities are to be done. In addition points are assigned to the individual activities. No minimum number of points are required, however when you finish, the park staff total the points and write them in their records and on your certificate. The booklet is well designed with great pictures and on durable paper to hold up as you complete the program. Activities include ; Safety First, Take the Pledge. . ., Saguaros By The Numbers, In One Saguaro’s Lifetime. . ., Your Day, Your Park, Your Adventure (optional), Scout Out A Visitor Center, Travel an Accessible Trail, Healthy Parks, Healthy People: Pick-A-Trail (optional), File Your Hike Report and Be A Citizen Scientist (optional). Saguaro By The Numbers is a numbers challenge, 12 fill-in-the-blank statements about saguaros, numerical answers are printed randomly all over the page for you to use. 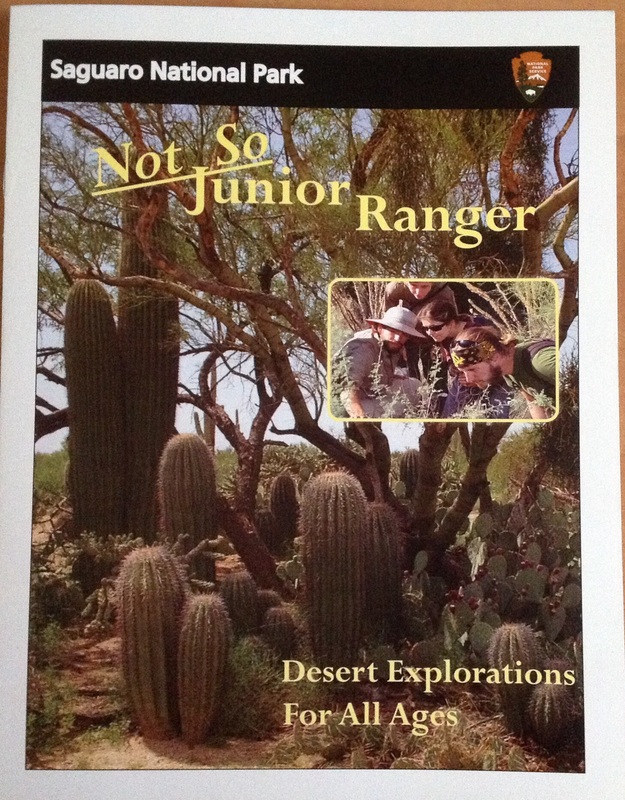 You will need to use the park brochure and handouts available at each visitor center. A few answers are obvious, but for most of them you’ll need to use the resources. Scout Out A Visitor Center has questions about either of the centers, points are given for correct answers. You only need to complete questions for one center, however if you answer for both your total points will add to the overall score. Answers to questions are not necessarily readily available from printed resources or in the visitor centers. A ranger told us you are expected to ask staff, rangers or volunteers, for answers to some of these questions. In other words, don’t look all over, as we did, it is OK to ask. Two activities, one required and one optional, involve a hike. The required hike for Travel an Accessible Trail is a paved trail, one at either unit, or both. The trails are 1/2 mile and 1/4 mile, so even doable on a hot day – carry water and wear a hat. The optional page lists several hikes at each unit, points are given for distance and calories expended. The trail distance range from 0.5 mile to 18 miles, round trip. Any of the hikes from these two pages can be used for File Your Hike Report. The report involves writing up your Observations and Impressions. To complete this program, with a minimum of activities and points, it can be done in a couple of hours and by visiting only one of the units. 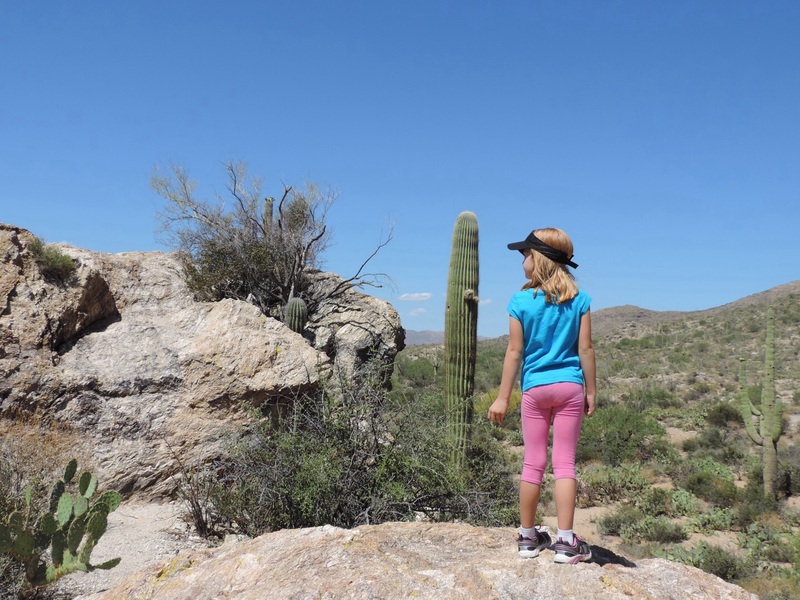 To maximize the experience and points, a full day or more of exploring Saguaro National Park would provide enough time. When you complete the booklet park staff will review and total your points. When we did it time was spent reviewing incorrect answers, which helped to learn more about the park. A certificate, separate from the booklet, is completed and presented. 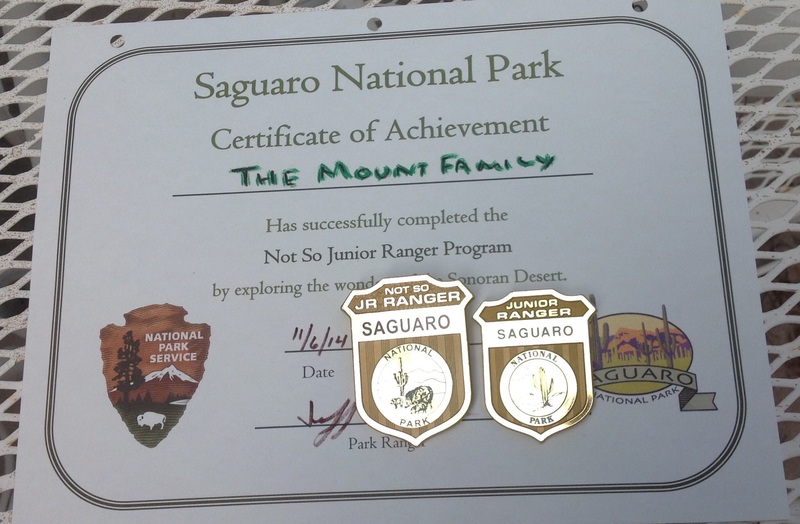 The badge is similar to a Junior Ranger badge, but slightly larger. I included both in the photograph below for comparison. However much time you spend or how detailed you complete the program, spending any time in the desert among the Saguaros is treasured time – Enjoy!